This organization is the brainchild of Savitha Sastry, the renowned Bharatanatyam artiste who is widely credited as having changed the ground rules of how this ancient art form is conceptualized, presented and perceived, and her husband AK Srikanth, a corporate executive by weekdays and an author of stories outside that world. The husband-wife duo is recognized as the team that has brought about a renaissance in this ancient art form by marrying the aesthetics of Bharatanatyam with the power of an intelligent and novel storyl..ies. The overwhelming success of their last three productions have validated their telief that Bharatanatyam can be completely understood and appreciated by the uninitiated, without compromising on anything for the connoisseurs. The concept of using traditional dance forms to convey hitherto unheard (or rarely heard) stories is a format that is increasingly used by several dancers. Few, however, have been able to present concepts that have been called 'edge of the seat' in the same manner as popular cinema is described. Savitha's productions have been acclaimed as path breaking in that they convey a profound philosophy in a fashion that has been understood by audience of all races, cultures, nationalities, religious denominations or age. And yet, they are based out of pure classical Bharatanatyam. In the darkness that enveloped a materialistic and angst filled world, she came as a saviour. She danced to the music of the Gods, and lived amongst the people as a beacon that would lead them to their salvation. But when the beacon burns to become a raging fire, who is the saviour, and who seeks deliverance? This is the story of a Prophet — of her destiny, her divinity and her doubt. 'The Prophet' is a production that carries within it an intensity that will leave the audience thinking about it for a very long time. The stunning audio visual accompaniments, the completely out of the box musical score, and the achingly exquisite choreography and denouement of the presentation adds up to something far more than an evening of entertainment — it becomes an experience. 'The Prophet', a story written by AK Srikanth, follows the life of a woman named Devaduta as narrated by she herself. Devaduta's life started in the slums of a non-decrepit town where her beauty seemed out of place with the milieu. Even as a young child she braved the worst that life had to offer, including a relationship with her abusive father. Always an introverted and withdrawn child, she starts to hear a Voice that spells out the 'path' to her. 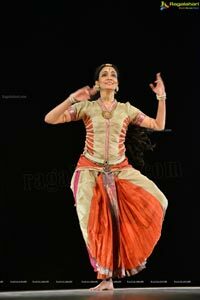 Devaduta runs away from her town, finds employment in a dance academy and discovers her natural talent for dancing. The kindly Guru of this academy trains her and she blossoms into a dancer of such repute that audience and critics believe she reaches a divine plane through her art. Devaduta also goes on to help the downtrodden with her fame and wealth. This, coupled with the fact that she kept hearing a Voice make her known as the living Messiah, or the Prophet. 'The Prophet' is the fourth Solo Bharathanatyam Dance Theatre production, following in the foot-steps of the previous shows - 'YUDH', 'Soul Cages', and 'Music Within'. 'The Prophet' is perhaps the hardest hitting of them all and narrates the story of Devaduta, the woman who was hailed by the world as the saviour. She danced to the music of the Gods, and lived amongst the people as a beacon that would lead them to their salvation. But, when the beacon burns to become a raging fire, who is the saviour, and who seeks deliverance? This is the story of a Prophet - of her destiny, her divinity, and her doubt. English voice overs will guide viewers through out the performance.